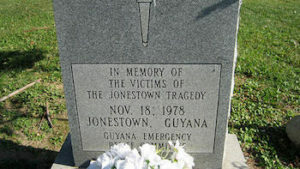 To continue to push the blatant lie that the 918 men, women, boys and girls killed at Jonestown “committed mass suicide” constitutes an insult and an injustice to those who lost their lives in that massacre, as well as to the memory of Congressman Leo Ryan and members of his delegation (including two members of the press) who were killed when Congressman Ryan, who represented a congressional district from which many members of the “Peoples Temple” cult had been recruited (and who was also a former mayor of San Francisco, where the Peoples Temple had been headquartered before it moved to Guyana) visited Jonestown to investigate the allegations of abuse and enslavement that had come to his attention. In addition, to continue to refer to Jim Jones as an “itinerant preacher” (as the above-linked NPR piece does in its second sentence, immediately following the first sentence which is quoted above) is to ignore the undeniable connections between Jones and very powerful patrons, many of them mentioned in the video documentary. Such a description is absurd. You can also listen to a somewhat condensed, audio-only version of the same material by visiting the archive of Bonnie Faulkner’s long-running show, Guns and Butter. You can scroll down to episode #188, which aired on November 18, 2009, and which you can listen to online (or download to a mobile device) by following this link. Congressman Leo Ryan of the House of Representatives was a representative of “the government” — which is to say, a representative of the lawful power of the people (in a democratic republic). The fact that he was murdered demonstrates a desire by those responsible for the things that were going on at Jonestown to prevent the details of what they were doing from becoming known to the government. The massacre followed his murder and the murder of some of those with him. The continued repetition of egregiously, demonstrably false explanations of the Jonestown massacre as “mass suicide” demonstrates very much the same thing regarding the potential threat posed by the people themselves, should they ever wake up to what is going on. Indeed, it is the power of the people themselves (should they ever become aware in large numbers of what is going on) which poses the greatest threat, because (as we have seen in the forty years since the perpetration of the massacre of more than 900 American men, women, boys and girls in Guyana), the representatives will not on their own do much of anything to confront the problem if the people themselves do not wake up and demand it. 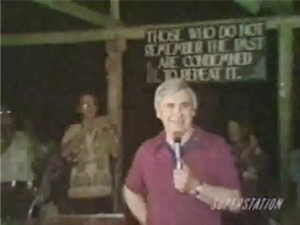 Right a screenshot from the video documentary, showing Congressman Leo Ryan in Jonestown, on the night of November 17, 1978, the day before he was murdered. You can see this image at about the 0:49:49 mark in the video.